Put me on the list for more, of course. I have a gut feeling, this is the most difficult one, too. Especially for teachers who are in a culture, not speaking the language, not understanding the differences in humor etc. And often it means to also show my weak points to students, or on the other hand present my strong points. For many the “Middle” is so comfortable. And Blogging; my best new students and parents are the ones who come because they have searched the net and found my website. They know exactly what they will get and this is what they want. Last year, you shared a TED talk here. Now, right after that I got 2 new students calling. I had to tell them I was booked, but that there was a possibility 6-8 month later. you can imagine I was blown away, and this feed back of course got me on my legs to work something out getting them over. As always it’s been a real pleasure watching you and listening to your invaluable tips. Keep ’em coming. Thank you so much Richard for taking the time find ways to help us grow, as people and as teachers. Love your enthusiasm when you share things with us. Terrific video. Your enthusiasm, useful tips are extemely inspiring. I hope to watch more. Looking foward to your next video! Thank you, thank you everyone for the kind words! It is so nice to hear! I’ll get working on the next video for you now. Is there anything in particular you’d like me to cover? Great tip. I am an advocate of inclusive education i.e. making quality education accessible to all kinds of children , especially those with special needs. And you are right. We get more students from families who believe in our philosophy and mission. Thank you Richard. I teach part time and I believe in being myself, if they don’t like my lessons that’s fine. I use genki english and I also teach children art, so I combine english and art together as well as singing your songs and jumping around. Be yourself and people will appreciate it. Great job! Thank you for your love and energy in teaching English. I’m always excited by all your works. @Ingrid: Fantastic – love what you are doing! @Wayne: Great stuff. I’ve actually got a friend here who is doing some amazing, like crazily amazing, stuff with art in class. I’ll see if I can pop down and make a video for you! Thanks John, let me see what I can do! Hi Richard, I like the “be yourself” idea. You certainly practice what you preach! 🙂 However it still requires venues for your potential clients to see you! One time I heard you mention the idea of being seen in the community. Not just in the context of teaching English, but doing other things like volonteer work. That can be your best publicity. Thank you for continuing to give back, again and again. @Tood: Thank you, much appreciated! It was inspiring to hear that being yourself can help. This video is really pragmatic… Offlate I see lot of schools spending a lot of money in advertizing for growing their school strength. As you said people could believe only if they know you better. So blogging and demos are cool ideas. Thank you so much Graham for your precious advice! Look forward to your next tips. Thumbs up! Hello, Richard you are always inspirational, it’s a great idea. So many people have web sites, and their own pages, but all they do is fill it up with, often videos taken from other places, or it is purely publicity which only shows, for example, english lessons with happy kids. It is certainly more interesting for people to get to know you on line, and then choose, and so one more time such a simple idea, and so effedtive, thank you! Thank you Richard for the lovely advice. I have a direct question. How much is the hourly going rate for a private lesson in Japan that is not held in a big city. Not too many foreign teachers in my area. Thank you. Would anyone else be interested if I did a video on pricing? Hi Richard, thanks a lot for your video and for sure i liked your ideas about being yourself and blogging ! i’d like to get some videos with fantastic ideas. Great! I really enjoy your teaching. Congratulations and thank you for sharing! Richard, I call you the “God of English”. Because the songs you come up with are so amazing (even moms are singing them), the ideas that you share are so valuable, the energy that you give to teachers around the world is worth a lot!!! Thank you so much!!!! Being yourself is just the most important thing when you follow a great leader, because you never can be an exact copy of him. As I saw how Richard works I thought to myself: I like it so much but I don’t think I can do what he does, and HOW then can I teach GenkiEnglish? So it took me some time to “tame” GE, to find a way how I can be myself and use all tips and techniques Richard shares with us. Fantastic! !Love your enthusiasm. !Thank You for sharing.I’d like to see more. Great, Richard! Thank you so much for the useful tips. I wonder how I can be enthusiastic like you to attract more students. Looking forward to your other videos. Good thought about “Blogging”, that sounds like a thing to try. Reflecting ones personality in the school is an awesome tip. Thanks again Richard. I love Genki English. Keep the Genkiness coming!! Our school uses your lessons to add on to their curriculum. Haha, nice “blog” – you are a funny man. Challenges are how we grow! Blogging works great in China! Thank you, Richard, for the encouragement to put out there what we really have on offer :-). Thank you Richard! I enjoyed the video, the concept of being yourself and show who you are.. The idea of blogging is cool, but that requires time..any tips on how to actually do it without taking much time off preparing for lessons? How to set your blog? I’ve helped 2people start up their blogs -a psychologist and an engineer, but wouldn’t know how to start mine.. I teach to adults, and I teach kids through songs, games and drama. It would be also great to know how teachers like Wayne, or your friend, combine Art and English. @Annie: Everything good takes time and smart work! 🙂 I am thinking of maybe this year doing a module on online market too, I’ll see! thanks a lot Richard for ur greaaat video. This Top tip is great!!!!! You’re always inspiring confidence in everybody!!!!!!!!!! Thank you Richard! You always cheer me up whenever I ask by myself “Am I OK as an English teacher?” I am not good at put something on SNS things. It is like talking in front of a LARGE audience… it makes me really nervous. But it is really true that it is very good way to know about myself by everyone around me. Actually I put my class room’s photo in the “time LINE(everyone who connected with me by LINE can see the article or pictures)” by mistake, before long, 2 friends contacted me like… ” Are you teaching English?” and their kids are now my students. So I think it is very true that Richard said in this video! Well I read your E-book which is full of nice tips. In it you said “Do it today, not tomorrow” ..OK. Thank you again Richard… you always with us English teachers and I feel “I can do it!” whenever I saw your messages. Thank you Thank you Thank YOU! I have been watching you for a few years, but only recently made the leap into my own classes. I will be attending training in Tokyo and be purchasing a set soon! I am so inspired by the work you have done with Genki English. Great videos and teacher materials. Great article Richard! I have a question about the blog, well 2 actually 🙂 1. If you live in an area where most people don’t know English, how can you make it easier for them to read what you write? Have a translation under the original? 2. Best way to get people to have access to the blog.? Hope you have continued success. Excellent work! @Elham & Diana: Thank you! @Mari: Excellent story about LINE!! 🙂 ( LINE is the Japan equivalent of Facebook) I was reading a story yesterday about one of the best video bloggers. He was terrible! But he forced himself to make one new video everyday for a year. And you know what happened? He became pretty amazing at it! @Margaret: See you in Tokyo! @Brad: Yeah the blog has to be in the local language. Obviously if the parents could understand an English version then they probably wouldn’t need you 🙂 But this is one way video really helps, because speaking is always easier than writing. Plus as I mentioned to Mari above, it massively improves your language skills if you force yourself to do it everyday or even week! For getting more people onto the blog, I’m going to see if I can add an Online Marketing module this year as lots of people have been asking! Your video is useful. Ussualy I go the same way and it works. Thanks for your job. Thank you very much Richard for your enthusiasm and inspiration! Your cool video encourages me to act. I used to be very shy to show my personality and hobbies to other people (especially my clients) but I´ve always thought that being yourself is the most important thing. It gives you freedom, self-esteem and happiness. Keep up the good work! Thank you so much ,Richard! It’s a great video with wonderful tips! I am always looking forward to get your mails. I really appreciate all your emails. Learned a lot from you. May God Bless you continually! Thanks for good advice and inspiration! Agree with you. The main thing is to be yourself. Thanks a lot for your useful tips! Thank you Richard. You are a source of encouragement to us (English teachers). Your great efforts are really appreciated. Thank you very very much! More power to you! Very energetic and inspiring personality! That’s the way teachers should be to make learning fun. I’m glad I’ve came across your videos on youtube, (spent hours looking for good teaching tips!! )at last. Good tip about being yourself and making your school “personalised”. Thanks a lot, great stuff! A pleasure, as usual. Thanks. Great information. I am just starting out in Cambodia and am excited to use Genki starting with preschoolers and my teachers. Thank you. Thanks for all wonderful ideas! I manage a school in China. We have our great teachers’ team; kids making progress. But just few parents are happy, they don’t see their kids success. And I found the answer in the comments… Open doors! We just have to show parents what we have learnt! Thank you again! Just saw your video now, Richard! Have been busy with end-of -school year business, so I didn’t manage to watch it till now! I certainly agree with you, that when people know your personality and who you are, it reflects in your teaching. You are sooooo right about that! Taking myself as an example,…After school hours I have my OWN private school in different areas, and the truth is, it took just one person to provide by “word of mouth” how she liked my personality and teaching, and the rest is history! I am “no spring chicken” and yet I enjoy bike riding and even riding long distances…Well my students and parents think I am COOL and my enthusiasm about my riding influences my teaching…the GENKI way of course!Thank you Richard for sharing your awesome ideas! Everyone loves you! These are essential points you make – you are truly living your calling as a teacher, teaching others! I love the way you impart ideas, it is awesome. I wish you can share your energy to me 🙂 .Love love…you! Thank you for this video, Richard. I am the person who want to be loved by everyone and don’t want to make any enemies…BUT in your words ” it totally boring and bland just make nobody pleased not know students” Yes it is true. I was too afraid of making enemies so that I post anything on my facebook. Even put “I like”, I needed my courage. I will try change my attitude. Thank you Richard! Thank you Richard……not pleasing everyone is a new upsteram marketing strategy I’ll keep in mind….good point to me. It’s a great video and I heard of what I have expected. 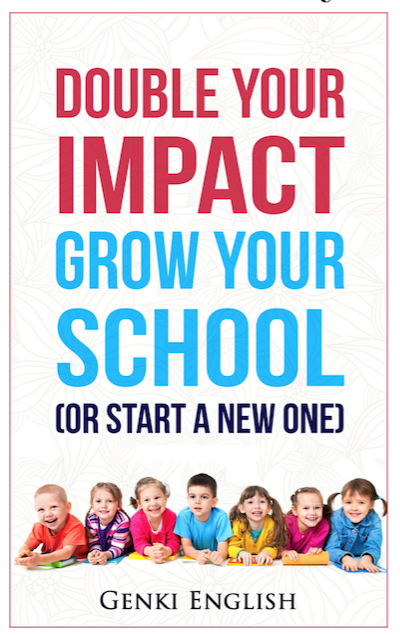 You’re so nice to share things that all beginner teacher is really wanted to know about starting their own schools. I am re-opening my private school this April and I’m really looking for all the materials on what to use for my children’s lesson and adults classes. Thank you again. Struggling at the moment within a system that demands I teach a syllabus I don’t find is amenable to the introduction of normal, natural language. I would love your advice on that! Great stuff Richard. Thanks for your willingness to always share so much. Your enthusiasm always lifts ones spirit when things get a little stressful. Keep up the great work. When are you planning on bringing out another Level for the Teachers Set? CD 13 is a few years old now. Good Luck. Not always easy being ourselves in some of the more reserved countries, but people eventually accept you if you are consistent. Good luck Esther and Monica! I enjoy your enthusiasm, and enjoy to see how much energy you have, and that you keep on going and going and going!!!!! it was really inspiring.The videos are really nice…just wanted to know more about how to create our own blog?? And what is essecial for that??? I am really impressed the way you are teaching…waiting for more videos….thanks. Wonderful tips Mr. Richard. İt contains great ideas and it’s good to watch your videos. Thank you Richard for the tip. I used to teach English long time ago and had to abandon my career due to various reasons. Now I wish I ‘d catch up and just don’t know where to start from. So that was an inspirational clue. Would you be so kind as to cover some practical aspects as well? i.e. How to fund a low budget but respectable ETL institute? Chryssanthie, I’ll be covering pricing in a later video so if you combine that with the tips in this video you should have enough cashflow for all the funding you need! @Sanskar: Actually the best place to start a blog right now is on Facebook. Especially for video blogs. The key with content is to solve someone’s problem. So think of all the questions and problems that the parents ask you and answer each one in a video blog on Facebook! Your video IS helpful. Will be waiting for the next one! Thank you so much for your work, Richard! I’ve just moved to Germany and having almost no network and only basic knowledge of German, it is quite a challenge. Back home I worked with both children and adults, my school was growing beautifully. Teaching is my passion, it is in my blood so… I’m back to building a school from the ground…and my life for that matter (that’s suitable for a few blog posts)! Thank you for a wonderful motivation! Loved this video…and yes I´m very interested in video about pricing, as I´m getting more students with your tips and almost have no time. Thanks Richard! Everything you say is true, especially regarding adult students. They need to feel secure and to know you. I just joined an aerobics class at my local gym here in Greece and after a couple of sessions some women who attend the class asked me for lessons:-). Keep the vids and emails coming. They are a lifeline in the somewhat precarious world of EFL! Though I am always myself, it is good to be reminded “Be yourself” and how to expose it to more and more people. I want to watch all your videos on this topic. Thanks so much. Very good you certainly have inspired me to into making a decision I need to make soon. I will keep you posted. Keep up the good work. Thank you very much for this video. It’s amazing! This is what all I needed to hear! Thank you so much Richard. Great things and wonderful ideas Richard, most welcome and so worthy to set in motion! Thanks forever for your incredible awesome bright coaching! Great video, indeed! It is extremely important for me to be myself and not hide. The blogging sounds good but would it need to be bilingual? All the eikaiwa websites are in Japanese. Also I have to consider how to host a site. But OK, I like your advice very much. I like your enthusiasm!! It is always great to watch your videos and it has been a real pleasure watching you today ! I think it’s very important to “Be yourself” so that you can enjoy better what ever you are teaching . @Michael: You could do it bilingually if you like, but it does take time so I’d just recommend the local language. And this is one of the big benefits of using Facebook video as your blog, it lets you get your message across even if your written language isn’t 100%! I bought a complete set of your Genki English before and I used it in my class for almost 5 years. Now, i want to start my own school and I read all the tips you are posting here. But I only have one question in my mind, If I will start to teach with one student in my house, what will I gonna use? A smart board or just my laptop to introduce Genki English? @Cathy: I’d definitely recommend doing groups rather than one student, and you’ll be find with just a laptop unto about 4 kids. After that just plug your laptop into a TV!